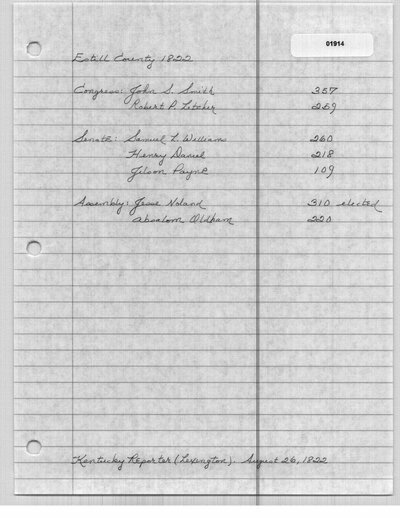 The August 26th and September 23rd Kentucky Reporter list the total for John Speed Smith as 2807. The county totals add up to 2805. "John S. Smith, by a small majority." The Weekly Messenger (Russellville, KY). August 17, 1822. "Robert P. Letcher, and not John S. Smith, as stated in our last, is elected in the fourth congressional district." The Weekly Messenger (Russellville, KY). August 24th, 1822. 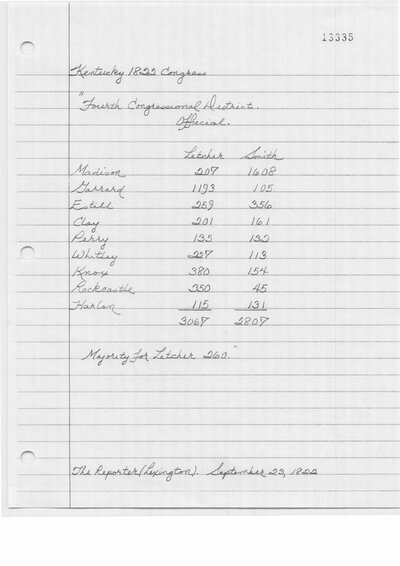 The Kentucky Reporter (Lexington, KY) August 26th edition reports 357 votes for Smith. The Kentucky Reporter (Lexington, KY) August 26th edition reports 103 votes for Smith and 1113 votes for Letcher. 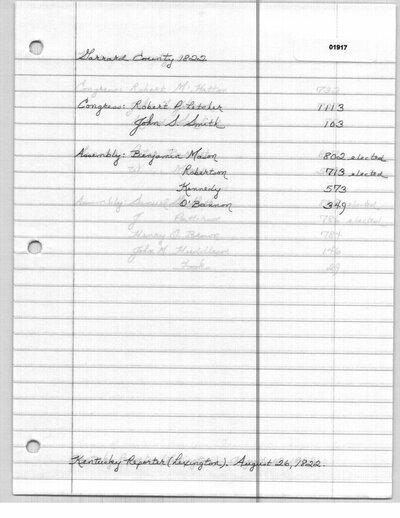 Original Election Returns. Kentucky Department for Libraries and Archives, Frankfort. Western Monitor (Lexington, KY). August 13, 1822. The Weekly Messenger (Russellville, KY). August 24, 1822. Richmond Enquirer (Richmond, VA). September 3, 1822. Kentucky Reporter (Lexington, KY). September 23, 1822.